Our product range includes a wide range of hydraulic trolley jack, inverter battery charger, reciprocating air compressor, rotary screw air compressors, engine crane and transmission work stand. 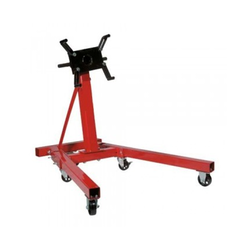 We hold expertise in offering a wide range of Hydraulic Trolley Jack. These are engineered using best quality components which make these jacks extensively durable and robust. Our devices are admired for their optimum strength, high functional efficiency and reliability. Besides, these are available in various sizes and range as per the requirements of clients. 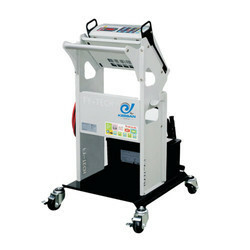 Inverter energy-efficient battery charger is a new kind of advanced pulse battery charger which comes with yellow-green backlit LCD display and can automatically detect, analyze, charge and maintain batteries, and intelligent programming. Detect, analyse, charge and maintain different types of batteries, applying to advanced charging devices at garages and repair workshops. 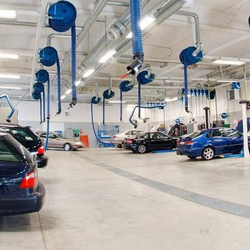 Used in the maintenance, detection and electronic control system programming process of cars in static state to prevent damage of control elements and loss of data caused by cars running out of battery during programming or other detection processes. With reverse connection reminder and no touch spark, the charger is applicable to all battery technologies to perform charging curves and charging detection. Electric-Driven Two-Stage Air Compressors. 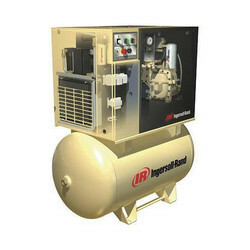 Designed for heavy shop or industrial use, Ingersoll Rand Electric-driven Two-stage air compressors provide the reliability and performance that are ideal for most applications and users including automotive service and body shops, fleet maintenance, machine shops, production and manufacturing lines, wood working shops, dry cleaners, car washes, general maintenance/repair shops and farms. Rotary screw compressors are more than integrated air systems; they are complete air solutions. Available in sizes from 4-37 kW (5-50 hp), they are designed to maximize the key drivers of profitability in today’s business. They provide ultimate reliability to maximize your productivity. They are also extremely energy efficient providing measurable energy savings. Whisper quiet operation with sound levels as low as 65 dB(A). More Air For Your Money Industry-leading performance delivers more air for less horsepower, saving thousands of dollars per year on energy. Smart, Energy Efficient Controls Industry-leading performance delivers more air for less horsepower, saving thousands of dollars per year on energy. Maximum Uptime Ingersoll Rand is so confident in the performance of the UP-Series, that 5 and 7 year warranty programs are available. 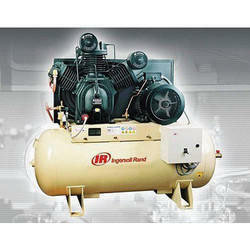 Contact your local Ingersoll Rand authorized service provider for availability and details. Installation Close to Point-of-Use Whisper quiet operation allows for installation closer to point-of-use, reducing costs and ensuring a better & safer work environment. Closely Maintained Pressure Reducing discharge pressure and avoiding excessive pressure bands increases downstream tool and equipment life. 70% Fewer Connections Smart integration eliminates leaks and pressure drops maximizing reliability. Compact Footprint Design Small footprint frees up valuable floor space and reduces install costs. Optional Total Air System Package Complete integrated air treatment package. 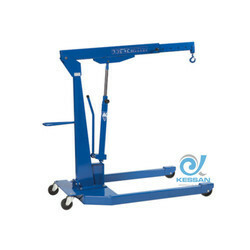 Keeping in mind the precise demands of clients, we offer a wide range of Engine Crane. These are acknowledged for their high load bearing capacity and reliability. We ensure robustness and sturdy construction of these devices. These are acclaimed for their longer working life and reliability. Our devices find their wide application in various heavy industries. 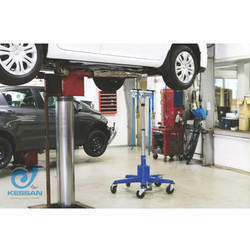 We are involved in offering a wide range of Transmission Work Stand. These are precisely designed from top quality components and following world class standard. Owing to its unmatched quality, rugged construction and longer service life, these stands are extensively recommended by various numbers of clients. We offer these devices at very feasible prices. With the help of our expert team members, we have been able to offer a wide range of Engine Work Stand. Compact designed these stands are acknowledged for their robust construction and reliability. These are acclaimed for their optimum strength, high functional efficiency and easy operations. Our devices find their wide applications in various industries. Leading Manufacturer and Supplier from Coimbatore, our product range includes General Workshop Equipment such as Engine Work Stand, Engine Crane, Transmission Work Stand, Hydraulic Press Machine, Hydraulic Trolley Jack and Battery Charger. 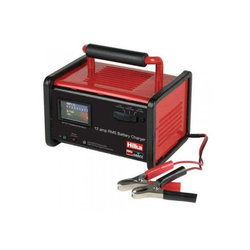 We excel in offering a wide range of Battery Charger. These are finely processed from top quality components which are procured from reliable vendors of the industry. Owing to its uninterrupted performance and longer service life, these devices are widely preferred by various numbers of clients. These are acclaimed for their high functional efficiency and consistent performance.